of hiking later, it is still over 200. This is so frustrating! the end of this hike, then so be it. Mile River in Connecticut, completed his thru-hike on Sept 4.
clothing choices like this are acceptable among hikers. Looking down at Caribou Valley Rd; today's destination. "Home is where I hang my food bag"
rained while I was hiking. I must be doing something right. today, just some good, honest work climbing up and down the hills. before Bob from the hostel was supposed to pick me up at 2:00PM. one the 7th call, Bob answered. "Bob, this is Monkeywrench, you were supposed to pick me up at 2:00 o'clock." "Um, okay, Where are you?" pick me up, but he had forgotten WHERE he was supposed to pick me up. He had been waiting for me at an entirely different trail head. daily specials. A bowl of that went down fast and tasted really good. and told me that was all that was left, and it was on the house. whipped cream. That was about 2 hours ago, and now I am hungry again! I called the Stratton Motel, which is in, of all places, Stratton. Rt 27, from where I will hitch into Stratton. that hikers use when slack packing. computer, but had only a marginal signal and a very slow connection. I go to sleep tonight. as from the book it looks like there isn't much resupply there. Friday at the earliest, so I will be missing a full week on the trail. towards the end of this hike, but that's life. the 25th, and at Katadin sometime around October 5.
be up to climbing the mountain with me. tackle the Bigelows in the morning. I was hoping, but not expecting, to make 15 miles today. 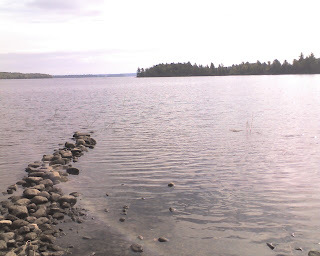 That would have gotten me completely through the Bigelows, it would have positioned me to reach the Kennebec River in time for the morning ferry on Wednesday, and it would have gone a long way towards ensuring I reached Monson by Saturday morning, in time for Jodi to pick me up. But my knees vetoed that plan, and I stopped here, at a campsite between Bigelow and Little Bigelow. That's alright. I am happy having covered 10 quite tough miles up and over the multiple peaks of Bigelow Mountain. After slack packing 6 of the last seven days, today I put my pack on again; and it was a heavy pack with six days of food in it. It is quite chilly this afternoon. It is only a quarter to five now, and I am wearing my light weight silk shirt, my medium weight tops and bottoms, long pants, my doewn sweater, and a hat. I was just thinking today, while hiking, that at the beginning of this hike I watched spring creep up the mountains, and now at the end of the hike I am watching autumn creep down the mountains. This campsite is rather spread out, and there is now somebody in another part of the site making all sorts of noise. I can hear things crashing and banging. I can't imagine what they're doing. It often surprises me how noisy some people are in the woods. To me it seems natural to be quiet when out in the woods. Brr. I think I will be breaking out my down jacket tonight! It's amazing how quickly I get chilled now that I am so darned skinny. Yup, you read that right; 22.5 miles today. I don't think I've done that many miles in a day since back in New Jersey somewhere! Basically, I hiked the 5 1/2 miles I had hoped to do yesterday, then I hiked the 17 miles I had planned to do today. That first 5 1/2 were up and over Little Bigelow Mtn, and I took my time with them. Once I got down Little Bigelow, the terrain really eased up. There were a couple of hills, but they were just hills, not mountains. One of them had about a mile of steady uphill, and the next maybe a mile and a half. I stopped at West Carry Pond Lean-to, 12.5 miles into the day, and felt gfood enough that I decided to try to crank out the 10 miles to here. I left West Carry Pond at 1:15, and arrived here at 4:45; 10 miles even in 3:30. Sorry if I sound like I'm bragging, but I feel so good knowing that I could do this. Okay, there's more to write about than just how great a hiker I am as long as the terrain is easy. How about the weather? It was cool yesterday evening and I thought it was going to be a cold night. I rigged my hammock for frosty weather, and went to bed wearing my long johns. I got up about 11:30 to pee, and I was very overheated. I took off my long johns and crawled back into bed. A few minutes later it started to rain very lightly. There were very light, brief showers on and off during the night. It never did get cold, and in fact I think it was warmer when I got up this morning than it was when I went to bed last night. It looked like we might get more showers all day, and in fact it still does, but so far no rain. And how about water? It has been wonderfully dry weather for the last couple of weeks. That makes for great hiking. But it also means that the springs and small brooks that serve as the water source at many of the shelters and campsites are starting to dry up. At West Carry Pond, where I stopped for lunch today, there is a nice little spring that even has a spring house built over it. Only problem is, it's bone dry. That left the pond as a water source. It has been quite breezy all day, and the lean-to is sited at the down wind end of the pond, so there were quite large waves crashing into the rocky shore. The waves were big enough that they acted like surf breaking against the rocks, and while I was trying to dip my water bottle into the pond to fill it, a wave broke and got me full in the face! From where I am tonigth it is only about 3 miles to the Kennebec River. The Kennebec is quite a large river, and the official way to cross is by ferry. Now, we are not talking about some big car ferry. We are talking about sa canoe. The ATC contracts with an outfitter to provide ferry service for hikers during the season. Right now, that means from 9 - 11 in the morning, and from 2 - 4 in the afternoon. I intend to be at the river waiting to be the first passenger of the day at 9:00AM. If I can do 18.7 miles tomorrow, and 13 on Thursday, that will leave me just 9 miles shoirt of Monson. That means I can be in Monson by noon on Friday. I am hoping Jodi is not working on Friday, and can pick me up then instead of on Saturday. Unfortunately I can't check her schedule, nor can I send this blog entry, as I have no cell service here. Well, it is getting dark enough that I am having trouble seeing the keyboard, so I am going to go square everything away for the night, crawl into my hammock, and read for a while. A full day today. It got pretty cold last night, and I was warm and snug in my bag, making it a bit hard to get out and get going this morning. But I was anxious to reach the Kennebec River. For some reason that felt like a big milestone to me. I was hiking a few minutes after 7:00, and I reached the river around 8:30. Dragon Breath was already there, having camped near the river last night. We waited until 9:00 when Dave, the guy that ferries hikers across in a canoe, showed up on the opposite bank. He soon paddled across, and after signing liabilty waivers and donning life jackets, we were off across the river. By 9:20 I was back in harness and heading up the trail away from the river. After lunch I climbed Pleasant Pond Mountain, and for the first time since Monday got cell phone reception. I sent yesterday's blog entry and checked email and voice mail messages. I had two messages from my daughter Anju informing me that the event I was going to attend with her next Monday has been postponed indefinitely. So, big change of plans! Instead of going home for a week or so from Monson, I will be continuing on into the Hundred Mile Wilderness and towards Katahdin. Only problem is, I had sent my bounce box home from Stratton, and had told Jodi not to assemble and mail a food drop to Monson for me. As soon as I heard Anju's message I called Jodi and luckily caught her at home. I asked her to put together a food drop for me and get it in the mail today if possible. A bit later I remembered that the last three maps are in the bounce box I sent home, so I called again and asked her to include those with the food drop. If anybody thinks hiking the trail is hard, think about how hard it is being the at-home support person. Jodi had just gotten home from work today when I called and started issuing frantic requests: send me 6 dinners, 10 packages of oatmeal, a package of English Muffins, a jar of peanut butter, etc. etc. And I will be in Monson by noon on Friday so you have to mail it today. Jodi actually asked me if it was alright if she had lunch first. Not sarcastically, either. She was actually going to skip eating lunch to go run around getting everything I wanted. It would be far more difficult foro me hiking the trail if I didn't have Jodi at home responding to my every whim. When I was down almost to the molttom of Pleasant Pond Mountain I rqan into Bookworm hiking southbound. I had last seen Bookworm in Shenandoah National Park, at Lewis Mountain Campstore where I had stopped to tqake a shower, eat some junk food, and drink a beer. Bookworm is doing some kind of art project about h=the AT and is interviewing hikers, so we sat down next to the trail and did a little interview for 15 minutes or so, then I said good-bye and pushed on the last 4 miles or so to this campsite. I had run out of water about three miles before reaching here, so I was really happy to arrive and get water from the brook. I expect to be in Monson by noon on Friday. My next task is to figure out Jodi's schedule and when she can meet me in Baxter, figure out how long it will take me to get there from Monson (right now I am thinking 7 days) then figure out if I have enough time to take a zero day in Monson. It will be 15 days without a day off when I get to Monson on Friday, so a zero day would be very welcome. I often wonder how some of trhe other thru-hikers manage to have such small, light packs. Well, I found out at least part of the reason this morning. It was cold last night, and when I got up this morning a bunch of other hikers were talking about how cold they were last night. Not me. I was toasty warm. I am carrying my warm sleeping bag, plenty of warm clothing, and plenty of insulation for the bottom of my hammock. First thing this morning I climbed to the summit of Moxie Bald. What a beautiful morning it was up there! The air was cold and crisp and still, the valleys below were filled with fog, and there were just enough puffy white clouds in the sky to give the sun something to shine on and to lend depth to the sky. After climbing down the mountain I stopped at Moxie Bald Lean-to for an early lunch. The shelter is near the shore of Moxie Pond so I took my food bag down to the water and sat on a rock in the sun and ate lunch with a gorgeous view out across the water. It was so peaceful and comfortable that I toyed with the idea of staying there and spending the day sitting in the sun reading my book, but practicalities won out and I soon pushed on nine more miles to this lean-to. Along the way I had to ford the West Branch of the Piscataquis River. As fords go it wasn't much; the water barely came to my ankles. But fords eat up time. You have to take your pack off, remove boots and socks, put sandals on, tie boots to pack, put pack back on, ford the river, then reverse everything. But, the cold water sure did feel good on my aching feet! I will be in Monson tomorrow. I have been frantically trying to figure the logistics for the final leg from Monson to Baxter. The problem is that I need to know Jodi's schedule and cell phone reception is lacking around here. Right now I am planning to take a zero day in Monson on Saturday. I haven't had a day off since I got back on the trail in Gorham. Tomorrow will be my 15th straight day of hiking. If I leave Monson on Sunday morning, I expect I shouid be in Baxter Park next Saturday. I may be able to get there on Friday, but that would be piushing pretty hard. Once I get to Baxter I need one more day to climb Katahdin, and this summer-long quest will be over! cold wind. It's definitely good to be in town today! is way better than I would expect to get in a small town like this. and likely a bit lost and disoriented. in, of all places, the general store tonight. I didn't do much today, which is exactly what a zero day is all about. pile of homefries, and 2 glasses of orange juice. haven't eaten those since I was a kid! of her completing her thru-hike. Well, it's off into the Hundred Mile Wilderness tomorrow. Hey folks, look at that! Less than 100 miles to go! I can remember how thrilled I was when I reached the first 100 miles of this trek, and now here I am at the last 100 miles. It's all starting to feel a bit surreal. age of a very young and very nervous Bob Dylan recording with Johnny Cash. It was awesome. Once I tore myself away from all the food, I repacked my backpack with all the gear that Paddyo had shuttled for me and hefted my now very heavy pack to hike the one remaining mile up here to Long Pond Stream Lean-to. As I am sure I mentioned before, my brother Dana and I hiked this section soiuthbound years ago. It was great fun reminiscing about that trip along the way today. I forded Big Wilson Stream today and remembered that when we forded it on that previous trip, Dana stepped in a big hole and went in nearly to his waist. And just north of Big Wilson Stream the trail crosses the Montreal, Maine & Atlantic Railroad tracks. When Dana and I hiked through here a small work car with two men aboard came down the tracks, and if I remnember correctly, Dana had a short, shouted conversation with the two men as they went by. I had entertained vague hopes of pushing 4 more miles today to reach Cloud Pond Lean-to, but that four miles includes a 2000 foot climb, and there just weren't enough daylight hours left to make it. I hope to be able to get through most of the Barren-Chairback Range tomorrow. It all depends on how my knees hold up to all the climbing and descending. I would really like to get over White Cap by Tuesday evening. That's the last significant climb until Katahdin. From where I am tonight it is 29 miles to Logan Brook Lean-to, on the north side of White Cap. The mileage is certainly doable, it's just the climbing that has me worried. Also, the forecast calls for a 40% chance of rain on Tuesday afternoon, and 50% Tuesday night. Rain up on the bald peaks would make for dicey going on the rocks. Well, we'll see what happens. I put in a hard day's work today, hiking from 7:15 in the morning until 6:45 in the evening. I started the day by climbing 1750' up Barren Mountain, then I traversed the entire Barren-Chairback Range: Barren Mountain, Fourth Mountain, Third Mountain, Columbus Mountain, and Chairback Mountain. 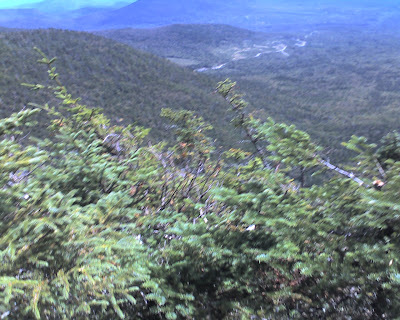 From Chairback Mountain I made the long descent to the Pleasant River, fordede the Pleasant River, and hiked another five miles up past the cut-off for the Gulf Hagas Trail. While coming down towards the Pleasant River I ran out of water. Hiking along, tired and dehydrated, I took the sixthe fall of this hike. It was really stupid; I caught the toe of my boot on a root and down I went. I reached the shelter about 15 minutes before it got too dark to see the trail. I set up camp, fetched water (had to use my headlamp), washed up a bit, cooked and ate dinner, and went to bed, exhausted. Man, oh man. I was tired when I woke up this morning! I pushed hard again today. I climbed the series of four peaks, each higher than the last, that culminate with Whitecap. From the summit of Whitecap you are supposed to be able to see Katahdin, and I tried to guess which blurry lump on the horizon that might be. From Whitecap I descended down to West Branch Pond Rd, then continued north another ten miles to reach this shelter. This is the same shelter my brother Dana and I stayed at on the first night of our northbound section hike to Katahdin back in '96. In the last couple of miles, after passing Crawford Pond, I saw 5 dead mice or voles or some such lying right in the trail. Not all in one place but rather scattered along the two miles. Very weird. It was almost as if someone were dropping dead mice along the trail. Vaguely disturbing. If I can pull off 21.5 miles tomorrow, I will be exactly one day ahead of schedule, which will put me in Baxter Park on Friday instead of Saturday. For the first time I can remember, I was the last one out of the campsite this morning. Not because I slept late or anything, but because the three people that slept in the shelter were all up and out early. I was up at 6:15, which is about as early as one can see in the morning nowadays, and on my way at 7:15. It was a long day, but mostly smooth, more or less flat trail made the going easy. It was almost like hiking in Virginia. I stopped at Antlers Campsite, on Lower Jo-Mary Lake. 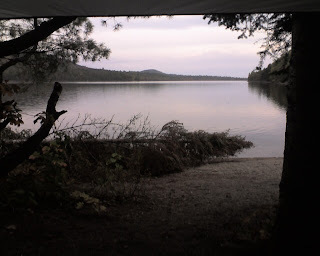 This campsite is at the site of an old sporting camp, and is a beautiful spot on a peninsula jutting into the lake and is in a grove of large red pine trees. I very briefly toyed wsith the idea of hanging my hammock and spending the day there reading and napping. I could do that and still make it to Baxter Park on Saturday, but I knew that come Friday night when I am sleeping in the woods instead of in a hotel room in Millinocket with Jodi, I would regret thje decision. So, I pushed on. There is a spot on Pemadumcook Lake where you are supposed to be able to see Katahdin, but it is overcast today and I couldn't see anything. Right now I am camped on the shore of Nahmakanta Lake, just inside the trees overlooking a sand beach. It is ridiculously warm today -- in the mid-70's -- so I took a swim in the lake. It is so warm that there are even some mosquitoes about! It has showered a couple of times today, and I just checked the weather forecast. 90% chance of rain tonight, with thunder showers after midnight! I hope the rain stops before I have to break camp and leave in thew morning. It is supposed to cool off tomorrow, with overnight lows in tje 30s tomorrow night. It looks like the best weather day for the weekend will be Saturday, so it is good that I will be reaching Baxter on Friday and we can climb Katahdin on Saturday instead of Sunday, when there is a good chance of rain. Orange juice. I have been craving orange juice for days now. Tomorrow morning I will come out of the Hundred Mile Wilderness at Abol Bridge on the Golden Road. The Golden Road is a private road owned by the timber companies, and Abol Bridge is where the road crosses the Penobscot River. At Abol Bridge there is a commercial campground and a small camp store. I sure do hope that store has orange juice! Today was a gorgeous day. Last night's storm was caused by a cool high pressure system moving in, so today has been breezy, clear, and cool. I had another 20 miles to hike, and you don;t, or at least I don't, cover 20 miles by lollygagging, so most of the day I had my head down hiking, but once in a while I'd get a chance to look around and appreciate what a beautiful day it was. And when I was up on Rainbow Ledges I had a wondrous view of Katahdin, standing resplendant with bits of clouds stuck to its peak. The mountain was 20 trail miles away, but probably about half that as the crow flies. It is going to be a cold night tonight, so I am getting my hammock rigged with extra under insulation, i.e. my down jacket. Tomorrow morning I expect to be at the store at Abol Bridge around 8:30 or 9:00, chugging a quart of orange juice and eating something fatty and delicious. Then I will be off into Baxter State Park where if all goes to plan I will meet Jodi around 2:00PM. Then we're off to Millinocket for a shower, a real meal, and a night in a soft bed. The forecast for Saturday looks good, so we will probably climb Katahdin that day. We do, however, have Sunday in reserve if need be. I charged up the battery when in town, everything would be fine. outside the store eating my snack. Boy, they stack 'em high! Georgia. That was kind of fun. I was getting chilled standing still, so I soon left and continued on. foot and one dry, warm foot. since they will be camping in the Park tonight. the mountain, and thus we could not climb Katahdin today. mountain, but I sure would prefer to get up there tomorrow. car headed for Katahdin Stream Campground. familiar voice say "Is that Monkeywrench?" Well damn, it was Slagline. and finally over The Gateway until we were on the Table Land. huge bank of fog poured over the ridge and enveloped us. and walked back to her car to wait for them. of high fives and hand shakes ensued.